There comes a time in every bird walk when someone much more knowledgable about plants than I am suddenly stops and points out a plant. Often, the plant is a fungus. Is a fungus actually a plant? According to http://herbarium.usu.edu, it is not. Rather, fungi have their very own kingdom–and what a special kingdom it is. Photographically, I am always challenged when we encounter cool fungi or plants along the trail while birding. This is because I only take one lens with me birding. It’s my 100-400mm and it doesn’t really perform well for macro photography. This doesn’t stop me, of course, from trying my best to get a shot of the life forms we encounter. Realistically, I am not going to tote my tripod and macro lens on birding walks to capture these plants better up close, so I will just have to live with the motion blur and shallow depth of field I end up with when shooting with the 100-400mm. It’s still better than what I get with an iPhone. 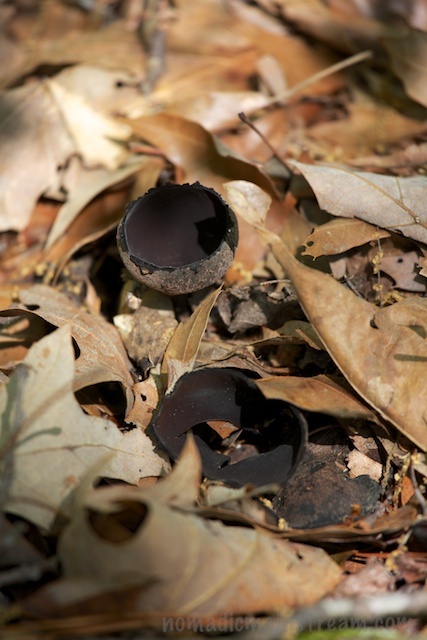 The first really interesting fungus we encountered looked like a block ping pong ball that hand been broken open. In fact, it looked so manmade to me that I would have assumed it was litter had we not had one of our plant experts on the walk. It amazes me when I see things like this in nature that we ever think we invented anything on our own. 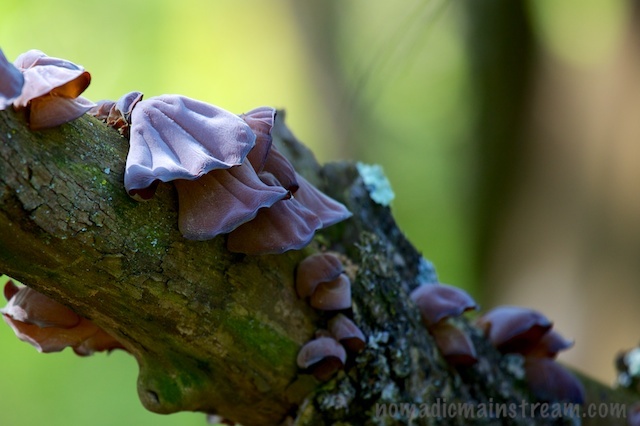 The second interesting fungus was a group of wood ears growing along a fallen log. They really do look like slightly slimy ears growing on wood. I believe this may be the birthplace of the idea for Mr. Potato head. Perhaps the wood ears were growing on a potato and someone thought, “Hey! That looks like a face with ears!” and then the idea grew from there. You never know. What kind of buckeye is that? The next interesting non-bird we saw was, in fact, a member of the plant kingdom. It was of particular interest to me because my Tennessean friends called it a Buckeye tree. As a person from the buckeye state, I can tell you that I have never seen a flower on any buckeye tree that looks anything like this one. 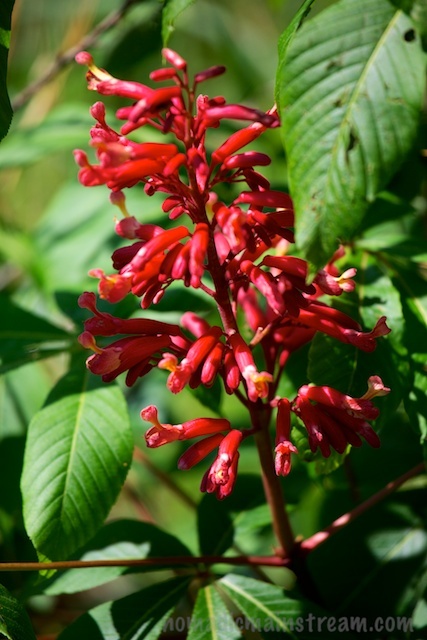 I have read on more than one occasion that the buckeye tree is indigenous to Ohio and not found anywhere else. I had doubted the truth of that, but now am wondering if perhaps what people call a buckeye down in Tennessee is not really the same tree at all. Whatever it is, it’s quite beautiful. We made our way out of the wetland a bit tired after such an early morning start. We found many birds in the 3 hours we spent wandering about. As we stood listening to a Cerulean Warbler just before calling it a day, we were surprised by the appearance of a Red-tailed Hawk, soaring happily overhead. 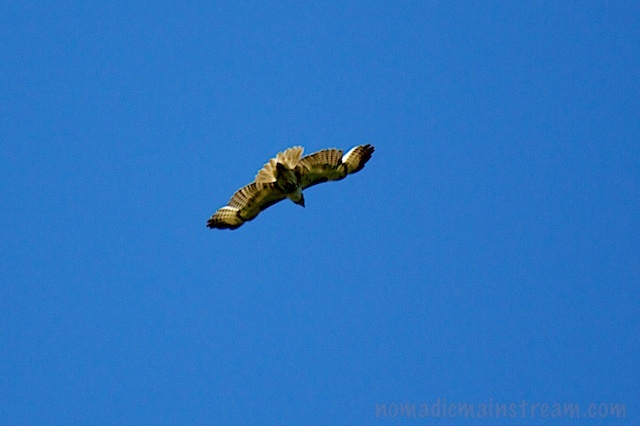 I managed to get this image of the immature hawk flying over head. This entry was posted in Birding, Chattanooga, Photography and tagged Bird photography, Birding, Fungus, Macro photography, Red Tail Hawk, Volkswagen. Bookmark the permalink.